On Saturday, ESPN.com reported the Knicks, Nuggets and Timberwolves were discussing a three-team deal that would send Anthony to New York; Anthony Randolph and Eddy Curry to Minnesota; and Wilson Chandler, Corey Brewer and a first-round draft pick to Denver. Sources said that, while Minnesota is interested in acquiring Randolph, it has little interest in sending Brewer to the Nuggets. 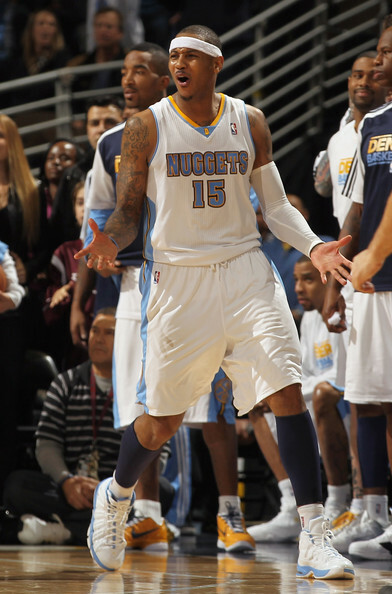 Moreover, a league executive in talks with Denver said it is likely the Nuggets would want more in a deal for Anthony. "The package New Jersey offered was so much stronger than this," the executive said. "To me this feels like Denver trying to lure other teams to the table." On Sunday, Knicks president Donnie Walsh told reporters he was "getting a feeling for possibilities" on the trade market. "We have a better feeling for what's going to happen," Walsh said. "I don't feel good or bad," he added. "These things take two to tango. But we're out there looking and seeing if we can do something. Some of it is not real big, trying to fill in the blanks within our own team." Rookie guard Andy Rautins and Kelenna Azubuike's expiring contract have been discussed as parts of the Carmelo Anthony three-team package, The Post has learned. The Knicks have to add more pieces to the reported three-team trade proposal for Anthony to make it work from a talent and financial perspective for the Nuggets, according to NBA sources. The Knicks, Nuggets and Timberwolves have had advanced discussions on a three-team trade, according to two people with knowledge of the situation. 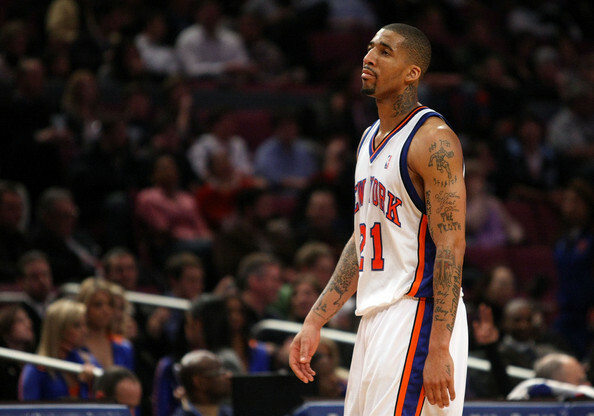 The Knicks would also give up Wilson Chandler, Anthony Randolph (to Minnesota) and Eddy Curry's expiring contract. Rautins, selected with the 38th overall pick out of Syracuse, has played in just four games this season, but his 3-point shooting prowess is a marketable NBA skill. And he is expendable. If the Nuggets agree to the package, it would be for the salary-cap space they can open up. Chandler, Curry, Azubuike and Minnesota's Corey Brewer all have expiring contracts. Chandler would be the only one they might want to re-sign. Denver would also get a first-round draft pick in the deal from Minnesota. 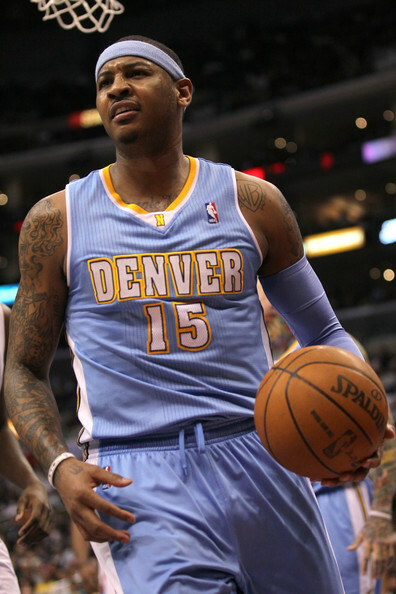 It's a sweetheart deal for the Knicks, but is it enough to entice the Nuggets? It is not better than the Nets' package, but the Nuggets at least have leverage if New Jersey reconsiders its interest in a deal. However, the Nets may have burned their bridge with Anthony. Chandler, who has been in a dour mood, had a smile on his face yesterday for the first time in a while after a locker-room prank in which his sweater was hidden from him after the game. Chandler had to leave the locker room in his white T-shirt. Perhaps the players shipped Chandler's sweater to Denver. Knicks president Donnie Walsh, who almost never admits he is engaged in serious talks, yesterday acknowledged discussions about Anthony were at least taking shape. "I don't think we have anything going, but we're getting a feeling for possibilities," Walsh said before the Knicks beat the Sixers, 117-103. "We have a better feeling for what's going to happen." In Donniespeak, that means things have progressed, with the trade deadline still a very long 19 days away. "If you get something that will help your team, then you get excited," Walsh said. "It hasn't come to the point I'm excited." "I don't feel good or bad," Walsh added. "These things take two to tango. But we're out there looking and seeing if we can do something. Some of it is not real big -- trying to fill in the blanks within our own team." 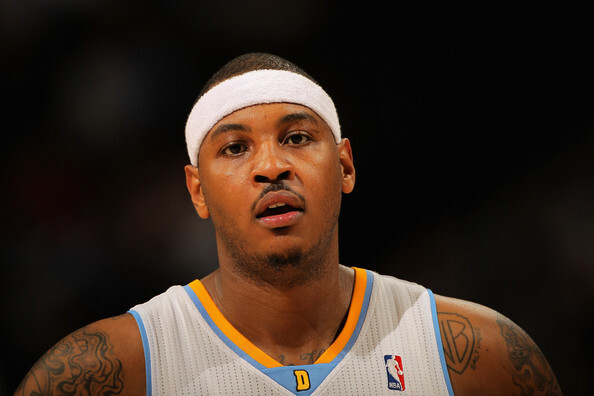 Carmelo Anthony is now saying that he'll consider signing a contract extension with the Nuggets. 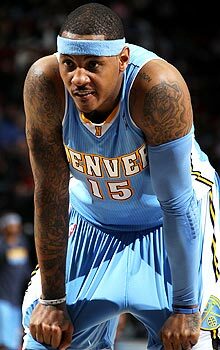 Anthony said he would "take a real hard look" at signing a three-year, $65 million extension with the Nuggets if he isn't dealt by the NBA's Feb. 24 deadline, according to the Denver Post. Over the past week Anthony has been linked to the Knicks and Lakers. The All-Star had never heard of L.A. as a suitor. "I've never heard of that. That was a new one," he said. "It is what it is. Everyday is something different. I guess now is the Lakers." Denver first offered Anthony the extension back in June. As rumors swirl that Carmelo Anthony is heading to New York or Los Angeles, the Denver Nuggets forward said he's thinking about staying put. Last week, sources told ESPN The Magazine's Chris Broussard that the Knicks and Nuggets were discussing a trade that would involve the Wolves and land Anthony in the Big Apple. Then Tuesday, sources told Broussard that the Lakers and Nuggets had initial talks about a deal that would send Anthony to Los Angeles and Andrew Bynum to Denver. That trade scenario surprised Anthony. "I've never heard of that. That was a new one," he said, according to the Denver Post. "It is what it is. Everyday is something different. I guess now is the Lakers." The Nuggets have had the extension on the table since June. The Knicks and Lakers would presumably want Anthony to sign an extension if they acquire him. 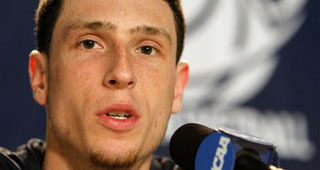 Anthony has long said that he would like to play in New York and he owns a house near Los Angeles. Since Anthony hasn't signed the extension, the Nuggets have explored trade talks instead of letting him walk as a free agent at the end of the season. This is the first time that Anthony has publicly said that he might re-sign with Denver. The health of Knicks forward Wilson Chandler could hold up a potential trade that would send Carmelo Anthony to New York, according to a report. According to The New York Daily News, Chandler is experiencing discomfort in his surgically repaired left ankle and may need surgery during the offseason. It would be his third procedure in as many years. Knicks coach Mike D'Antoni insisted Tuesday morning that Chandler "should be 100 percent" healthy. 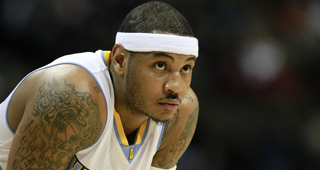 The latest Anthony deal involves New York, Denver and Minnesota, sources told ESPN.com's Chris Broussard. Recent rumblings have the Nuggets interested in Knicks point guard Raymond Felton being added to the Carmelo Anthony package, with the Knicks taking back aging Chauncey Billups. So far, that element has not been a consideration for Knicks president Donnie Walsh, whose signing of Felton has been one of the best values of the 2010 summer free-agent market. The Felton acquisition recently drew rave reviews from Lakers star Kobe Bryant, and the former Bobcats point guard was in consideration to be named to the All-Star Team as a reserve. He’s averaging 17.2 points and 9.0 assists, though his defense has been unspectacular recently. Billups, 34, always has been best in a halfcourt offense, and at his age, probably couldn’t handle Mike D’Antoni’s speedball system. Felton and Amar’e Stoudemire have made a nifty connection despite their recent slide. Billups’ contract is not guaranteed for next season, so one potential theory is the Knicks, in gaining Anthony, could waive Billups after the season and use the cap space for a legitimate free-agent starting center along the lines of Tyson Chandler or Marc Gasol. Then in 2012, the Knicks could sign PG Chris Paul, who also is represented by Anthony’s agency, CAA. However, the flip side is it leaves the Knicks without the kind of point guard D’Antoni needs for two seasons. Billups’ agent, Andy Miller, was quoted as saying Billups would want a buyout if he were traded to the Nets. Lakers coach Phil Jackson was over-the-top coy regarding the rumors the club may take Anthony for Andrew Bynum. 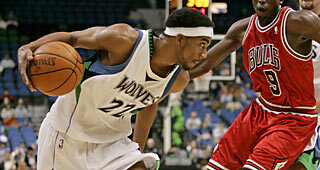 “If they gave us Anthony straight up for Derrick Caracter, we’d do it,” Jackson said. The NBA's trade deadline is less than two weeks away, but there haven't been quite as many rumors as we're used to this February. Carmelo Anthony has dominated speculation since before the start of the 2010-11 season and there is no guarantee the Nuggets will move him before the Feb. 24 deadline. So if Anthony isn't dealt, will the deadline come and go without much movement? It's too early to tell, but at least one NBA agent believes that an Anthony trade would lead to more action across the league. "The entire trade market through the NBA seems quiet, waiting for the potential Carmelo trade to occur," the agent told RealGM's Andrew Perna via e-mail. "That should have a domino effect throughout the league." So if you're looking for a host of trades, you'd better hope Denver decides to part with their All-Star forward. While the Nuggets are interested in trading Carmelo Anthony to Chicago, they are holding out for Joakim Noah to be included in any trade. The Bulls are adamant about Noah being completely unavailable. 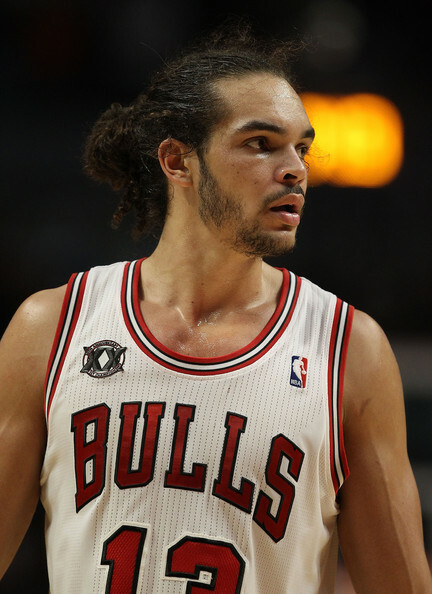 Chicago signed Noah to $60 million contract extension in October. As New York Knicks president Donnie Walsh remains unwilling to gut his roster to make a trade for Carmelo Anthony, the Denver Nuggets are fighting to hold together a coaching staff and locker room that has grown increasingly disillusioned with the franchise star, league sources told Yahoo! Sports. Several sources describe a locker room frustrated with Anthony chasing shots and points over winning games, a resistance to listen to coach George Karl and a distancing of himself throughout the season from the rest of the team. For these reasons – and a fear of losing him for nothing in free agency – few are buying the bluff of the Nuggets believing they can still convince him to sign a three-year, $65 million contract extension. The Nuggets are working on a contract extension for Karl, and no one close to him believes he can muster much enthusiasm to keep coaching Anthony. Karl has played along with the company line on wanting to re-sign Anthony, but sources said he’s far more at peace with coaching a rebuilding roster than this mix of Nuggets. Karl has struggled coaching Anthony with the loss of top assistant, Tim Grgurich, who left the franchise before the season’s start. The Nuggets are selling the idea they’ll be content to keep Anthony through the Feb. 24 trade deadline if no one meets their demands. The Nuggets want to package Anthony and Chauncey Billups( for a deal that includes Danilo Gallinari, Raymond Felton, the expiring contract of Eddy Curry and a draft pick, the New York Daily News reported. Another source said Denver is still pushing for more Knicks players, including rookies Landry Fields and Timofey Mozgov, in the package. As the Daily News reported, the wild card is Knicks owner James Dolan and the looming possibility he could overrule his president and cut a deal with Denver himself. There are fears that Dolan is listening too much to former president and coach Isiah Thomas and possibly agents and representatives for Anthony who have agendas to undermine Walsh. 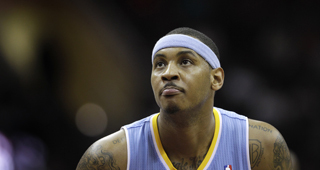 The parameters have been set in the talks between the Knicks and Nuggets for Carmelo Anthony. The Knicks are willing to part with Wilson Chandler or Danilo Gallinari and a source with knowledge of the situation said that including a Raymond Felton-Chauncey Billups swap would not be a deal-breaker. The issue at hand is the precarious decision to complete a blockbuster deal that involves even more players, perhaps rookies Timofey Mozgov and Landry Fields, and dramatically jumbles the roster, the starting lineup and the rotation with 28 games left -- and very little time for practice -- after the Feb. 24 trade deadline. The Knicks have one game left, Wednesday against the Hawks, before the all-star break and go into that game 4.5 games ahead of 9th place Charlotte, which is below the Mendoza Line. Quite frankly, it's hard to imagine a lineup with Billups, Anthony and Stoudemire would fail to finish the job and clinch a playoff berth in the East, but there's not much time to generate the necessary chemistry, nor would there be much of a bench, for a meaningful playoff run. And all of this falls on Mike D'Antoni, who, sources say, is resistant to a major roster shakeup. Donnie Walsh has reason to proceed with caution, too. Sure, the Knicks might have had Carmelo now if they were willing to give up as many as five players, including three starters, in the deal. But a person with knowledge of Denver's thinking said the Nets also thought they were close to an agreement several times, only to have Denver continue to ask for more. Denver's negotiating philosophy, so far, seems to come from the pages of the children's classic, "If You Give a Mouse a Cookie." Team executive Josh Kroenke and GM Masai Ujiri are the front men, but while owner Stan Kroenke is technically no longer involved because he's moved on to become owner of the NFL's St. Louis Rams, it's still his money. Also, recently ousted Nuggets basketball operations executive Brett Bearup still serves in an official capacity as an advisor to Stan Kroenke and multiple sources say Bearup has been and remains completely against trading Anthony to his preferred destination; at least not without the Nuggets walking away with an undisputable win. Donnie Walsh' patience might be the Knicks' best weapon here. The closer this gets to 3 p.m. on Feb. 24, the less time Kroenke has to change his mind. Or ask for more. But waiting also buys time for another team to emerge as a competitive bid against the Knicks, though the candidates are slipping away. The Nets could make a last-second move by re-emerging with their last offer before owner Mikhail Prokhorov pulled the team out of talks on Jan. 19 and put Carmelo on the spot to make a decision: go to Newark/Brooklyn with the extension for a guarnateed $65 million or stay in Denver and opt-out as a free agent in the unknown of a new collective bargaining agreement. But at this point, a source told me, "The Nets are out." The Lakers were hardly ever a real partner in this, though that didn't stop ESPN from spending an entire day talking about it. [Bloghost note: The thing to keep in mind with the Lakers and Andrew Bynum is this: if he doesn't reach all-star status in another year, he could be exactly what they need to engage the Magic in a sign-and-trade for Dwight Howard. Knicks fans should let this one go, because the Knicks didn't commit $100 million to Amar'e Stoudemire to then go ahead and sign Howard, who is mainly a pick-and-roll big man. Plus, Howard isn't a New York-type; he's totally L.A.]. As for the Rockets, a source said they're out. GM Daryl Morey gave it a look, thought perhaps the Yao Ming contract could make it happen, but a person with knowledge of the situation said Anthony has no interest in signing an extension there. The Rockets could just take him as a rental and work a sign-and-trade once he opts out, but, again, can Houston offer more value than even the Knicks' lowest bid? Hardly. At this point, a source with knowledge of the situation said the biggest -- and perhaps last -- remaining threat to the Knicks could be the Dallas Mavericks. Though Mark Cuban hinted recently that he would be willing to trade for a superstar without an extension, the source said Anthony would be amenable to signing an extension with the Mavs, who are already a championship contender and yet have a huge hole at small forward after the injury to Caron Butler. "The only way Melo doesn't come to New York is if [Mark] Cuban makes a play," that source said. The main issue, however, is that Dallas has even less to offer the Nuggets than the Knicks. The Mavs are searching for a third team to help them, with Roddy Beaubois, who has just returned from injury, as bait. But a source with knowledge of the Mavericks' thinking said he'd "be shocked if [Carmelo] came" to Dallas, but did say Cuban is unpredictable. But Beaubois, the source said, has been deemed untouchable. For the Knicks, the easiest play has always appeared to be to pass on a trade now and sign Carmelo as a free agent in the offseason, which would cause far less collateral damage. But that still comes with a risk that Anthony may panic and decide to sign an extension with Denver before the current CBA expires on June 30. As we reported on Monday, a source with knowledge of the situation said there is "more of a sense of urgency" from the Knicks to get a deal done before the deadline rather than to wait until free agency. But that doesn't mean the Knicks would be willing to pay top dollar if they know they're the only bidder. The Knicks know landing Carmelo would pave the way to attracting Chris Paul in 2012. But if Denver comes in at the 11th hour and demands the Knicks to add, say, Al Harrington (2012-13 salary of $6.68 million) or Chris Andersen's ($5.2 million in 12-13), that would compromise their ability to sign Paul, or Deron Williams, in 2012, plus build a championship-caliber roster. Carmelo recently talked about how much he has endured, but, really the entire league has been caught up in this ongoing saga since the summer. The anxiousness to reach finality, however, must be tempered. Talks between the Knicks and Nuggets are expected to carry through all-star weekend and things are expected to reach a boiling point by next Tuesday. "Don't expect anything to happen before All-Star," a source with knowledge of the situation told us. Hearing that was like being told the groundhog saw his shadow: Nine more days of Melopalooza. [Bloghost note: The thing to keep in mind with the Lakers and Andrew Bynum is this: if he doesn't reach all-star status in another year, he could be exactly what they need to engage the Magic in a sign-and-trade for Dwight Howard. Knicks fans should let this one go, because the Knicks didn't commit $100 million to Amar'e Stoudemire to then go ahead and sign Howard, who is mainly a pick-and-roll big man. Plus, Howard isn't a New York-type; he's totally L.A.]. Just get Howard here and I'll be happy. Once I read this, the rest of the article was pointless for me. Carmelo Anthony doesn't know what his future holds and is hoping for a resolution as the Feb. 24 trade deadline draws near. "I really don't know what's going to happen to be honest with you," Anthony said. Anthony said he's ready for a resolution, even though a number of options appear possible. 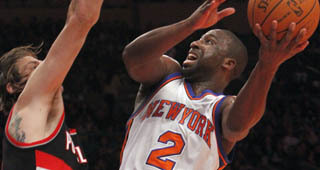 He has been linked to the Knicks, Lakers, Mavericks, Bulls, Rockets and Nets in recent months. "I know something will have to happen whether I sign the extension or whether the Nuggets move me or whatever," Anthony said. "Something is going to happen, so I try not to stress myself out about it." He said he can "see" all the rumors out there. "I turn on the TV, and I turn it right back off because it's always something, it's always a new team, always a rumor, always this person saying that, that person saying this," he said. "I try not to pay attention to it." Less than a month after the New Jersey Nets pulled out of trade talks, the Denver Nuggets have re-engaged the Nets in discussions on a blockbuster deal for Carmelo Anthony(notes), league sources told Yahoo! Sports. One source described talks as “progressing” and said they have been ongoing between Denver and New Jersey officials for more than a week. While the precise package being discussed was unclear, sources said talks have centered on a scaled-down package that still includes rookie forward Derrick Favors(notes) and draft picks. What also is unknown is whether Anthony has agreed to accept a three-year, $65 million extension with New Jersey if the Nuggets and Nets work out an agreement. The New York Knicks have been firmly engaged in talks with Denver, but haven’t come close to an agreement on a package of players and picks for Anthony. Anthony has expressed his preference to play for New York, but also is determined to get a deal done before the Feb. 24 trade deadline to ensure the contract extension. The Record of Hackensack (N.J.) is also reporting the resumption of talks. The Nets had twice previously thought they were close to acquiring Anthony only to have talks stall. Nets owner Mikhail Prokhorov canceled a scheduled meeting with Anthony last month and declared his franchise would no longer pursue the All-Star forward. In addition to not wanting to meet the Nuggets’ ever-increasing demands – Denver had sought Favors, Devin Harris, Anthony Morrow, at least three other role players and wanted to dump as much salary as possible on New Jersey – Prokhorov said on Jan. 19 he was pulling out of negotiations because he was unsure whether Anthony wanted to sign an extension with the Nets. Prokhorov had ordered Nets officials to not restart talks for Anthony unless the Nuggets first engaged them. Anthony has preferred to join the Knicks, but he runs the risk of having to settle for a smaller contract under a new collective-bargaining agreement if New York can’t get a deal done with Denver. While Knicks president Donnie Walsh has remained unwilling to gut his roster to make a trade for Anthony, the Nuggets are fighting to hold together a coaching staff and locker room that has grown increasingly disillusioned with the franchise star, league sources told Yahoo! Sports. The Nuggets are selling the idea they’ll be content to keep Anthony through the Feb. 24 trade deadline if no one meets their demands. The Nuggets want to package Anthony and Chauncey Billups(notes) for a deal that includes Danilo Gallinari, Raymond Felton, the expiring contract of Eddy Curry and a draft pick, the New York Daily News reported. Another source said Denver is still pushing for more Knicks players, including rookies Landry Fields and Timofey Mozgov, in the package.